Richard Lander and Pencalenick Open Orchestras at Cornwall Music Education Hub’s showcase event “Hub Sounds” Photo: Peter Glaser Photography. 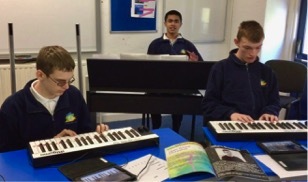 Music for Thrive - Open School Orchestras from Cornwall Music Service Trust on Vimeo. CMST’s inclusion team, headed by Steve Hawker, find ways of bringing the many benefits of music to those who lack the opportunities. Some of these are shown below (and many are free or subsidised with funding from Cornwall Music Education Hub). We’re also very happy to create bespoke projects or work that meets particular needs - contact office@cornwallmusicservicetrust.org to find out more. Open Orchestras are part of a growing national movement from OpenUp Music, with 45 schools across the country in 2018 from Truro to Tyneside. CMST started with two Cornish schools in 2016, with five from 2018. Those who want to take their music further have the chance to audition for the South West Open Youth Orchestra or National Open Youth Orchestra. CMST is excited to be part of this national programme to create pathways for disabled young musicians to develop, and have an equal opportunity to make a career in music. CMST aims to build on the subsidised instrumental lessons and free whole-class music available to all schools, by giving young people with disabilities the opportunity to become a member of an orchestra too. The film below shows a performance at Music for Youth festival in 2018. “When they began they were a disparate group of young people with significant communication issues… remarkable for their lack of ability to interact with each other, or with anybody else. They were very much on the edge in school. Now they are a real harmonious group, and they interact regularly together. And it’s only through the sphere of music that they’ve learnt to do that, and to cooperate and to communicate. Its magical!” Helen Campbell, headteacher, Pencalenick School. “First Access” whole-class instrumental tuition is available free for one term per class (with grants from Cornwall Music Education Hub). Alongside traditional instruments, CMST also uses music technology so music-making is more accessible for children and young people. Training for school staff is integrated within the programme. There are many free music apps on iPads suited to a wide range of abilities and interests, from working on cause-effect or stop-start, through to sophisticated performance and composition with apps such as GarageBand or Launchpad. Other “accessible musical instruments” are sometimes available in schools, such as Sound Beams, or the Skoog (pictured here), to help find an instrument suited to each student, and become part of the class band. The Thrive approach and Trauma-Informed Schools have become more familiar in Cornish schools, with free training available from HeadStart Kernow. This helps schools work with young people whose education and development has been disrupted through mental health issues, special educational needs, disabilities, or through traumatic or challenging life circumstances. Assessment in school is combined with providing interventions often based on creative play, and referrals to professional therapists or agencies where needed. Children and young people who respond well to music can find this offers a means of non-verbal self-expression, a way to help regulate emotions, build resilience, and explore communication and social interaction. CMST has a team of qualified music therapists who provide professional therapeutic interventions. CMST has teachers in all instrument families experienced in working with children with additional needs or disabilities. Funding towards costs is available from Cornwall Music Education Hub, so lessons can be either half price or free, for looked after children, those with an EHCP, and those having free school meals. Instrumental lessons are also available in music technology, although subsidies are not currently available for these. Pencalenick Open Orchestra at Cornwall Music Education Hub’s showcase event “Hub Sounds” Photo: Peter Glaser Photography.